Gaining New Twitter Followers Fast and Easy! So you Say you want to gain more Twitter Followers Fast. There are plenty of sites and services out there today that promise to get you thousands of followers in no time flat. Become the next big thing on Twitter ! 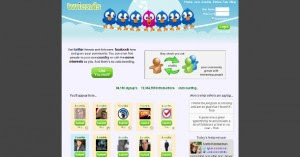 Anyways, The site that I want to review today is called Twiends ( formerly known as Fast Followers). The way it works is based on a credit system. You follow others and the credit amount they offer for you to follow them is put in your account, Which you then offer for others to follow you. On the credit system the house always gets one credit so say you offer 4 credits per follower when it shows on the site it will display as 3 credits per follower. It’s a very easy way to gain followers fast and one of the best things is the Unfollow rate seems to be quite low ( They are doing the same as you, Looking for Followers ) and you know that because they are there they are Active Twitter Users. If you hold your mouse over the picture of the person you are thinking about following the system will tell you a little about the person and whether they tend to unfollow people allot. There are a couple of other resources as well, You can use your FaceBook account to gain fans or become a fan. You can also post your website as well. ( I’ve been getting a bit of traffic from people looking at my site, But am not sure how productive it is yet ) You can gain Credits as by looking at other websites in the system as well. It kind of reminds me of a traffic exchange in a way. Well that’s about it for today and If your looking to build your twitter follower count, You should give Twiends a try.